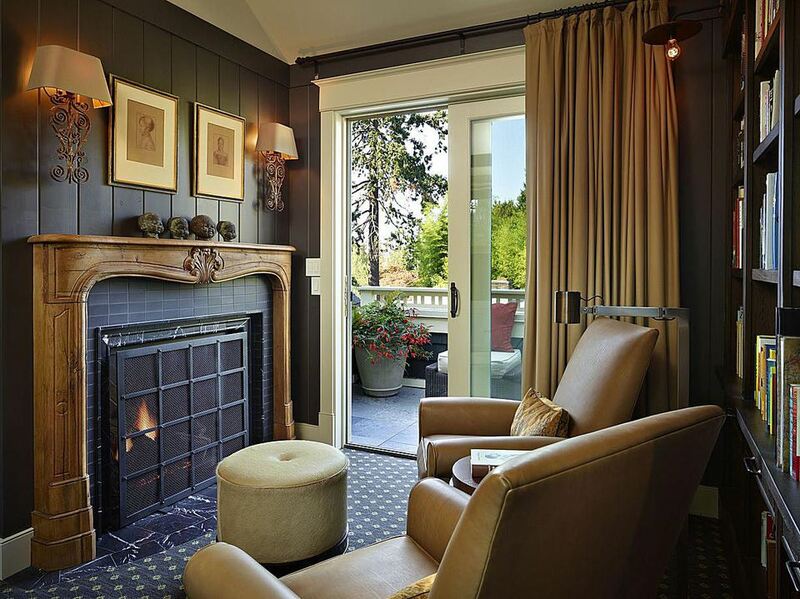 Fall and winter weather definitely call for a warm and cozy room like this one. Notice the rich dark brown paneling, textured carpeting and soft caramel-colored drapery that surround the room. A wall full of books and a pair of soft leather chairs, seated right in front of a roaring fire are incredibly inviting. Budget tip: don't have a working fireplace? A mantel can easily be purchased (or DIYed) and affixed to a wall. Throw in some flameless candles and you've just created that warm ambience your room needed. Warm metals are hot right now, and for good reason too: the warmth of copper, bronze, brass or rose gold can instantly warm up a cold room. If your home needs something warm, try adding some copper to your space. This kitchen simply hung copper pots on the wall for an easy display. Budget tip: it's easy to find antique copper at garage sales and flea markets. If it needs polishing just sprinkle the surface with salt and rub a cut piece of lemon over it. You can also use a copper colored spray paint to transform pieces you already have. Need more ideas to warm your room? Just add glowing lights like this kitchen did. Even though the bulbs are exposed, their light bounces off of warm metal, which casts a nice light in the space. Although these are the feature lights in the kitchen, they aren't the main source of light. Notice the spot lights that fill the glass-fronted cabinetry as well as under the cabinets and overhead. Putting all of these lights on separate switches means that the homeowners can control how bright, or how dim, to make the space. Budget tip: the trick to have a nice, warm glow in your home is to have lots and lots of separate lights. Lamps and wall sconces are great as you can control not only how many lights are on at a time but where the light is coming from. Read these lighting tricks here. You can also switch your main switch to a dimmer. Texture and patterns can give a room more depth and dimension, and a wallpaper like the one in this cozy dining room is sophisticated and rich. Our eyes are drawn to this type of wall treatment. Just like your favorite fall pumpkin spice latte can make even a common cup of joe feel extra special, this wallpaper envelopes you and makes you feel like you're sitting in a very special place. Budget tip: wallpaper can be expensive to purchase and install. If you're on a budget, try painting a stencil on the wall. If painting is too much DIY, find some richly patterned wrapping paper and either frame it around the room or Modge Podge it to a blank canvas - the bigger the better. The look of real wood in the home immediately looks rich, expensive and inviting. Having a texture in the home that you actually want to touch is a great way to add something special. Wood floors are a common way to introduce this design element to a home, so are wood beams, doors or window trims. But an all-wood wall like this one here makes a really strong statement. Adding plank wood siding to the walls can be an investment and you may need to hire a professional to install this for you. Budget tip: you can find discarded pallets and install them on your walls for a less expensive look. You can also use a product like Stickwood which sells very thin pieces of real wood (see their site for the full range of colors and styles). A peel and stick adhesive on the back makes this super easy to install on your own. If you can't use it on your walls try using it on a headboard or cabinetry.